There will be a table quiz held in The Hibernian Inn, Nenagh on June 24th at 9pm. This event is to raise some much needed funds for an under 16 soccer team from Gaza who will be visiting Nenagh in July. Its is €20 for a table of four. Bring along your fiends and family for a fun quiz night in the HI-B. 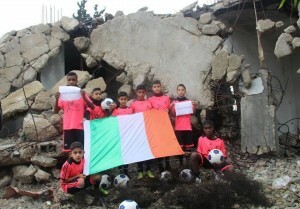 The team fom Gaza will be travelling Ireland for 2 weeks in July and as our guests we will be providing them with all of their accomodation, travel and meal costs. In order to do this we need to raise in the region of €1000 per child. We really hope to show these children the time of their lives but we need to raise funds to make this happen. Please come along to this event and help us show these kids a great Nenagh welcome which they deserve.